Eventually, Joe settled in Newport in 1986 to pursue land-based roles in repair, yard management, construction and refit implementation, ultimately establishing Loughborough Marine Interests, LLC in 2003. and the Portsmouth yard in 2006. Joe’s own yachts, Belle and Carina, always in upgrade and maintenance mode! SALLY JO Hunt 50' Fast Cruiser Power – Major refit. SURF 70' Ray Hunt/ New England Boatworks – Oversee, manage new construction. SAVANNAH 90' Pedrick/ Concordia. 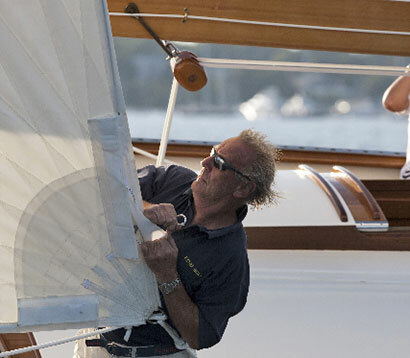 Classic sloop - design & construction assist – delivery/racing captain. MATADOR Frers/Huisman 83' Sloop – New England Boatworks Mechanical, rig, and systems refit. METOLIUS Frers/Huisman 84' Sloop – In water hardware, paint and cosmetic co-ordination. LIBERTY 165' Perini Navi – Newport Shipyard – supervision of major paint and Mechanical refit. 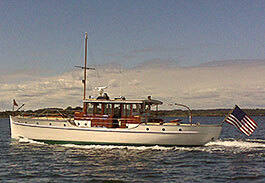 BELLE 38' Luders 24 sloop – Barrington RI, major cold moulding hull repairs and general refit. Asst. Yard Manager – Cove Haven – Barrington RI - new commissioning, refit and repairs. Hood/ Little Harbor, Portsmouth RI – Special projects, Refits, rigging and repairs.